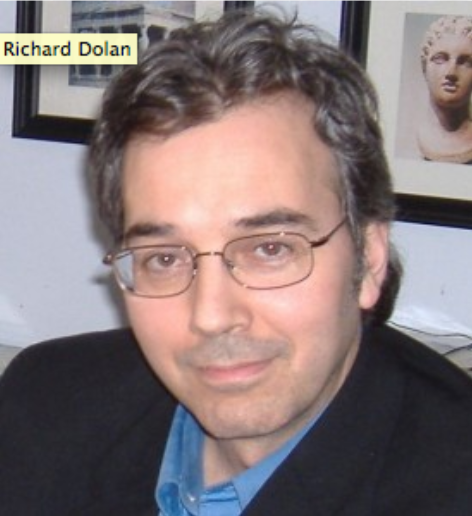 Richard Dolan has been researching the phenomena of ET's and UFO's for nearly 20 years. His rational insight into the subject has resulted in being the only invitee at 2013's Citizen Hearing on Disclosure in Washington, DC to speak six times, with each time going well over the time allotted for most other speakers. The event was attended by six former US congressmen, is designed to encourage political leaders to admit what they know and usher in a new era of ET understanding. An accomplished author, Dolan's rock solid research and logical approach to the subject is quite convincing. His website, available here, lists accomplishments and speaking engagements for which he has been in demand all over the world- our world, that is. Dolan offers keen insight into why it is that governments want to keep UFO disclosure under wraps, and what we need to do to have that decision reversed. Be sure to check his blog to keep up to date on his personal thoughts about his journey. Fridays 9am, Saturdays 2am & either 8am or 5pm, and Sundays 4pm EST.